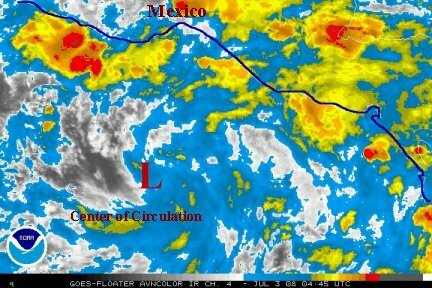 The monsoon trough is still active and a new tropical depression is forming. 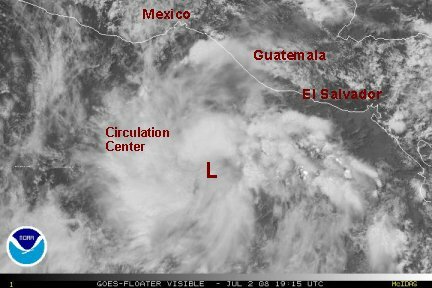 Quickscat satellite imagery shows a low center west of Costa Rica. Last edited by Caribbean Traveler on Sat Jul 19, 2008 8:36 pm, edited 2 times in total. The convection has weakened just a bit. The Quickscat shows 30 knot winds on the northside of the disturbance, but does not quite close off the low at this time. Conditions are still favorable for development. Nothing significant from 12 hours ago. Conditions are still favorable for development. Last edited by Caribbean Traveler on Sat Jul 05, 2008 9:42 pm, edited 2 times in total. The convection has really quieted down. The low level spin is still aparent. 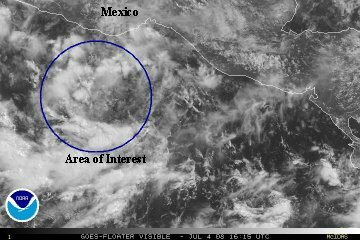 There is still potential for development in the next day or two. What started out as a sure bet for development is now only looking somewhat possible. The low level circulaton is still apparent on the visible and Quickscat satellite imagery. The deep convection comes and goes and is not solidifying near the center of circulation. 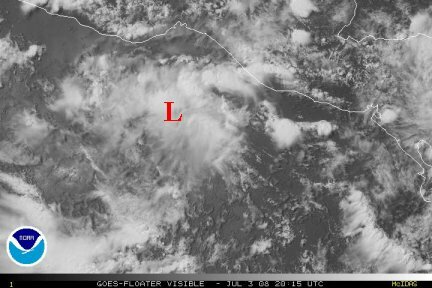 Development is still possible over the next couple of days south of Acapulco. NHC upgraded to depression 5-E. There has been an explosion of deep convection. This depression is organizing very rapidly now and is probably a storm. 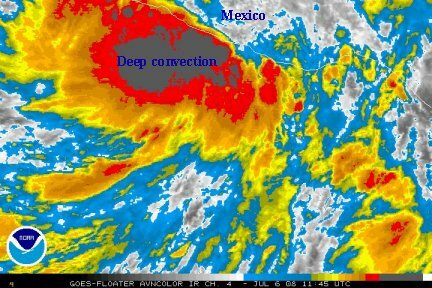 Very heavy rain is falling on the westren Mexican coast. Flash flooding and mudslides are a concern as it moves slowly northwest the next couple of days. Last edited by Caribbean Traveler on Sun Jul 06, 2008 8:36 am, edited 3 times in total. Very heavy rain is near shore. If this depression was in the Gulf of Mexico, it would definitely be classified as a tropical storm due to the possible flooding impacts. The depression should be upgraded soon and flash flooding / mudslides are a concern. NHC's changed their philosophy on the last update and did not upgrade the depression. Reasoning was due to lack of ability to find a surface low. Since about the last hour or two, a very well defined surface low is apparent on the satellite imagery, especially on the loop. 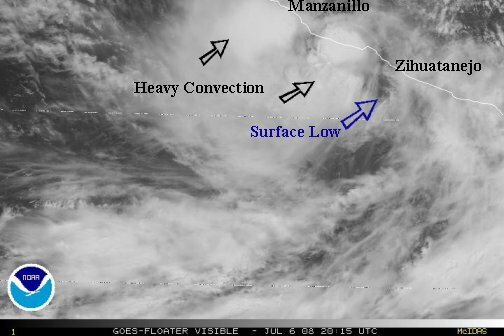 The surface low is centered southwest of Zihuatanejo. No doubt this has been a tropical storm today. Upper air winds are starting to expose the low and it is getting very close to the coast. So it is possible that "Elida" will never get named if it moves inland. 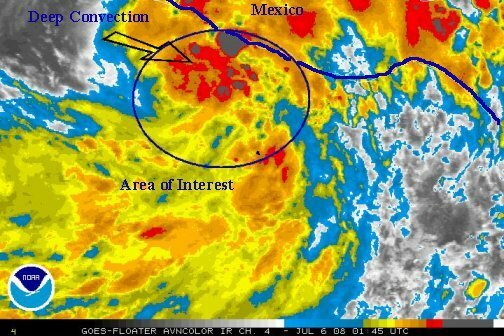 Flooding rains and mudslides in Mexico still pose a big problem. Last edited by Caribbean Traveler on Sat Jul 19, 2008 8:47 pm, edited 2 times in total. It looks like the depression is moving inland. NHC's official track dissipates the depression inland in the next 12-24 hours. We still stick by our guns and say that this actually was a minimal tropical storm during the day Sunday until high level winds sheared and finally exposed the exact low level center that was so elusive. Regardless, Heavy rain with the threat of flooding / mudslides will continue into Monday for Mexico. Rainfall totals may be in the 5-10 inch range with locally higher amounts. This will be the last advisory, unless this system regenerates off shore.